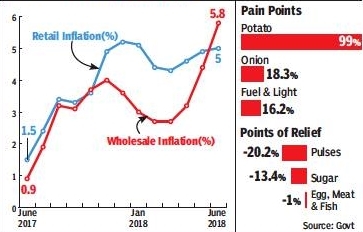 Wholesale inflation soared to an over four year high in June on the back of costly vegetables, fuel and manufactured products’ prices, prompting economists to say that the RBI will most likely raise interest rates when it reviews its monetary policy next month. Wholesale price index rose an annual 5.8% in June, higher than 4.4% in the previous month. This was a 54-month high number for the WPI, since it touched 5.9% in December 2013. Food inflation rose to 1.8% in June, higher than 1.6% in the previous month. The government also revised upwards the annual rate of inflation for April to 3.6% compared to 3.2% reported earlier. The RBI largely focuses on the retail inflation or consumer inflation numbers, but the spurt in WPI inflation highlights the price pressure in the economy. Latest data released last week showed retail inflation rose to a five-month high of 5% in June. The WPI data showed vegetable prices rose an annual 8% in June, higher than 2.5% in the previous month. Potato prices increased 99% in June. Economists said they expect several factors to influence the inflation trajectory in the months ahead but expect the central bank to raise interest rates, keeping in view the increasing price pressure.